SUMMARY: A variety of congenital syndromes affecting the face occur due to defects involving the first and second BAs. Radiographic evaluation of craniofacial deformities is necessary to define aberrant anatomy, plan surgical procedures, and evaluate the effects of craniofacial growth and surgical reconstructions. High-resolution CT has proved vital in determining the nature and extent of these syndromes. The radiologic evaluation of syndromes of the first and second BAs should begin first by studying a series of isolated defects: CL with or without CP, micrognathia, and EAC atresia, which compose the major features of these syndromes and allow more specific diagnosis. After discussion of these defects and the associated embryology, we proceed to discuss the VCFS, PRS, ACS, TCS, Stickler syndrome, and HFM. 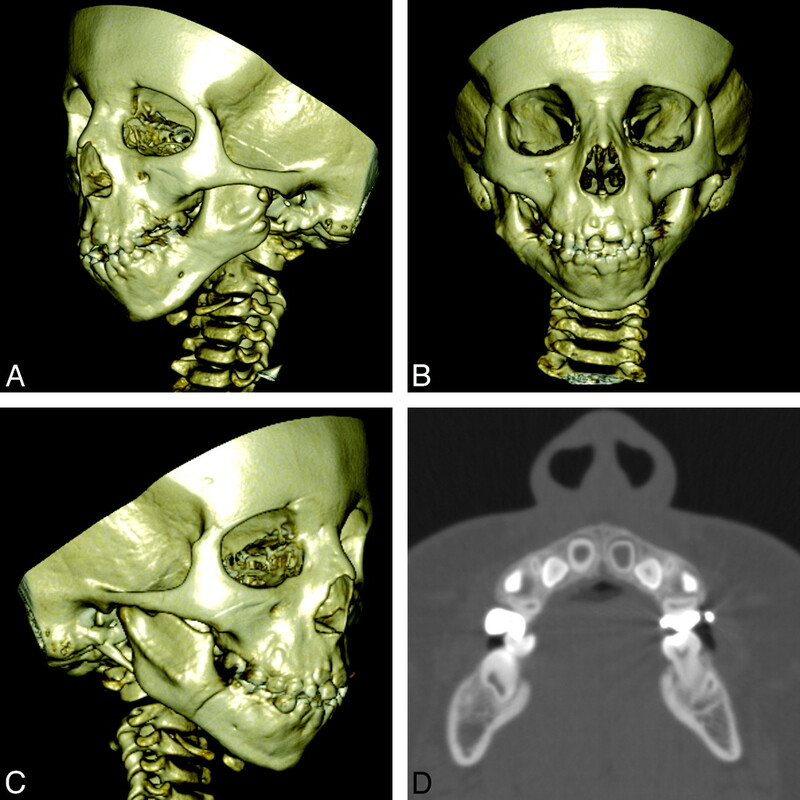 Radiographic evaluation of craniofacial deformities is necessary to define aberrant anatomy, plan surgical procedures, and evaluate the effects of craniofacial growth and surgical reconstructions.1 The recent rapid proliferation of MDCT is due, in part, to the increased utility of this technique for multiplanar bone and soft-tissue imaging. The definition of fine bony structure of the craniofacial anatomy on CT images is unmatched by other modalities. There has also been increased demand for treatment planning along with the advances in high-resolution CT evaluation and 3D reconstruction techniques. Knowledge of the genetic basis of human disease and its effect on embryologic development has expanded greatly in recent years. Disorders of the first and second BA are generally thought to result from a combination of inadequate migration and inadequate formation of facial mesenchyma. Because many structures of the head and neck migrate during fetal development, an understanding of embryologic development helps determine the origin and nature of congenital lesions. Familiarity with craniofacial embryology and its associated effects on resultant anatomy also leads to a better understanding of the pathophysiologic basis of craniofacial syndromes. Additionally, it helps to establish a search pattern for characteristic radiologic features of many of these anomalies. Part 1 of this review establishes the embryology, developmental anatomy, clinical symptoms, and characteristic imaging features of the isolated defects that compose some of the major features of the syndromes of the first and second BAs. Part 2 of this review discusses the syndromes and their radiographic features: PRS, HFM, ACS, TCS, Stickler syndrome, and VCFS. When applicable, the disorders number of the public data base of bibliographic information about human genes and genetic disorders—the Online Mendelian Inheritance in Man (http://www.ncbi.nlm.nih.gov/omim)—is given. CT is the imaging technique of choice for studying syndromes of the first and second BAs. Modern MDCT scanners offer the additional ability to reconstruct facial bone data for dedicated evaluation of the middle and inner ear. We recommend acquiring images in the axial plane and reformatting sagittal and coronal high-resolution CT scans through the midface in planes parallel and perpendicular to the hard palate. Images should be obtained axially with a bone algorithm at a section thickness and interval of ≤3.0 mm. We recommend a 1.5-mm section thickness obtained by using a helical technique with 50% overlap of sections. Intravenous contrast may be administered in surgical planning to evaluate the aberrant course of the internal carotid artery but is typically not necessary. 3D CT reconstruction often allows a unified appreciation of abnormalities, which may aid in the detection of abnormalities and formulation of differential diagnoses. The complex interrelationship of malformations seen in craniofacial syndromes is often not adequately conveyed on axial and nonaxial planar reformations.1 3D imaging provides clinicians, radiologists, and patients with a quick easy-to-understand overview of craniofacial structures. These 3D representations can also be used for life-size model formation that can be used in surgical planning. Dorsal aspect of the germ disk from an approximately 15-day embryo. 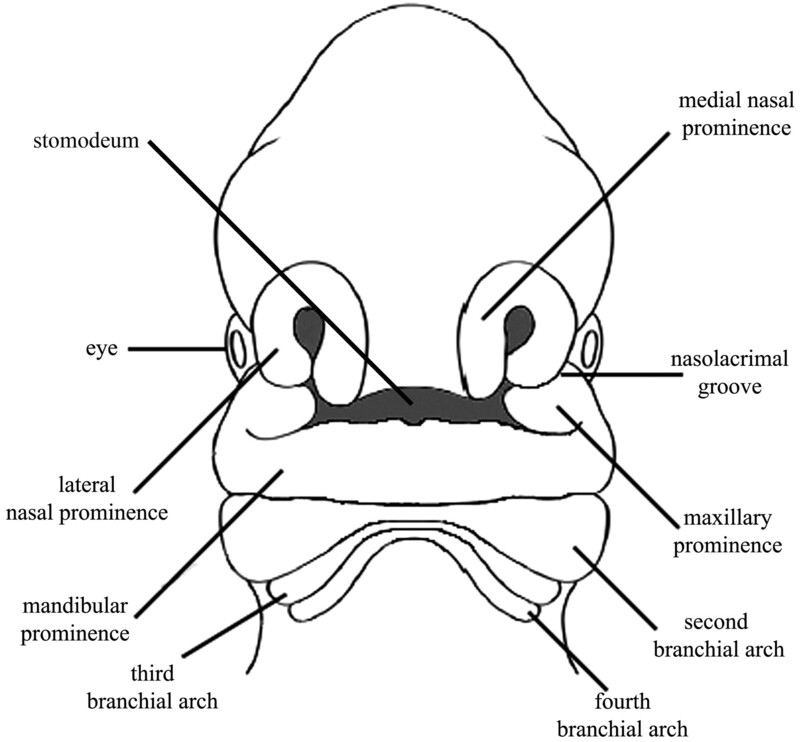 Frontal view of an approximately 30-day embryo showing the positions of the stomodeum relative to the medial and lateral nasal prominence and the maxillary and mandibular prominences. 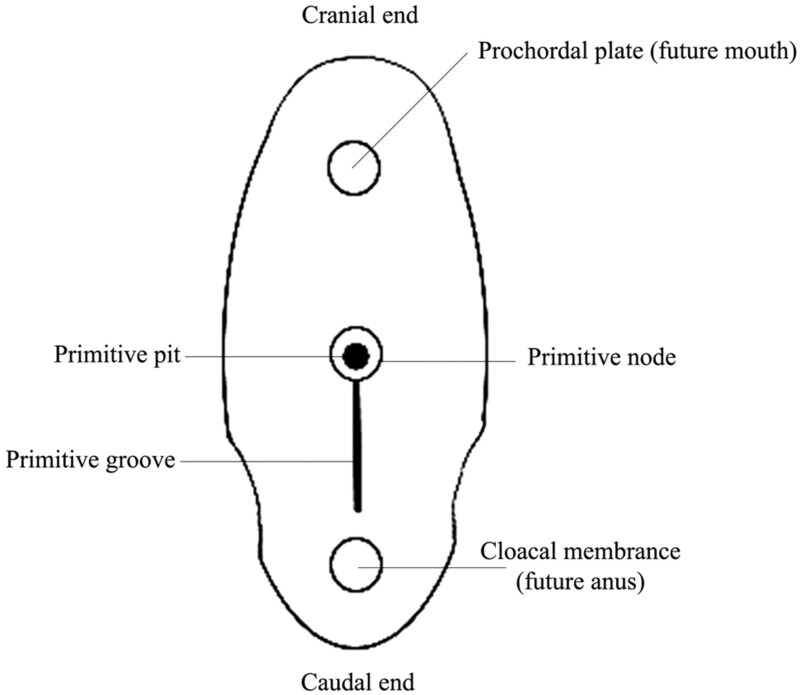 The mandibular prominence of the first arch lies caudal to the stomodeum. The maxillary prominence represents the dorsal portion of the first BA and is located lateral to the stomodeum and the frontonasal prominence. The mesenchyme of the maxillary process gives rise to the maxilla, zygomatic bone, and a part of the temporal bone through membranous ossification. The mandible is also formed by membranous ossification of mesenchymal tissue surrounding the Meckel cartilage, the cartilaginous mesenchymal component of the first BA. The first BA additionally gives rise to the muscles of mastication, the short crus and body of the incus and the head of the malleus, parts of the auricle, the anterior two-thirds of the tongue, and the mandibular branch of the trigeminal nerve. 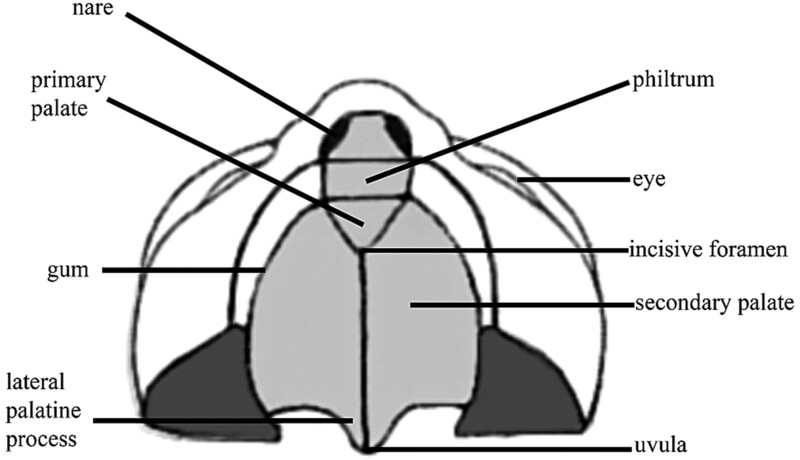 Ventral illustration of the palate, incisive foramen, gum, lip, and nose. The radiologic evaluation of syndromes of the first and second BAs should begin with studying a series of isolated defects that compose some of the major features of these syndromes and allow a more specific diagnosis. Failure of fusion between any of the facial structures (eg, failure of maxillary swellings to fuse with the intermaxillary process leading to cleft; see discussion above) results in a cleft, which may be unilateral or bilateral. Clefting of the lip and palate is seen along a spectrum, extending from occult discontinuities within the orbicularis oris muscle, which may be detected by using high-resolution postnatal sonography,22 to grossly visible clefts involving skin, muscle, and bone. Radiologic evaluation of facial clefting should focus on searching for primary defects of the lips and palate and then proceed in a systematic fashion to associated defects (Fig 4). Sonography can be used to identify clefting prenatally in the lip and primary palate (anterior alveolar ridge). Prenatally identifying a cleft in the secondary palate or an isolated cleft palate is difficult and virtually impossible with older equipment. Thus, the role of careful postnatal clinical evaluation remains vital. CT evaluation of facial clefting is typically reserved for complex cases and those with defects or complications outside the lip and palate. A, A 44-year-old woman with CP. 3D bony reconstruction shows a bony cleft (arrow) extending from the left aspect of an asymmetrically enlarged pyriform aperture to the alveolar surface. B, Axial CT image shows a bony cleft (arrow) between the left central and lateral maxillary incisors. C, Coronal CT image shows the extension of the bony clefting (arrow) to involve the primary palate. Auricular atresia in various degrees of severity. A, Axial CT image in a 64-year-old woman with nonsyndromic EAC atresia shows marked narrowing of the bony EAC (arrow). B, Axial CT image in a 9-year-old girl shows severe atresia with a lateral bony plate (arrow). The middle ear cavity is small and dysplastic (arrowhead). There is also ipsilateral microtia. C, Axial CT image in a 3-year-old boy with Goldenhar syndrome shows complete bony atresia of the right EAC. 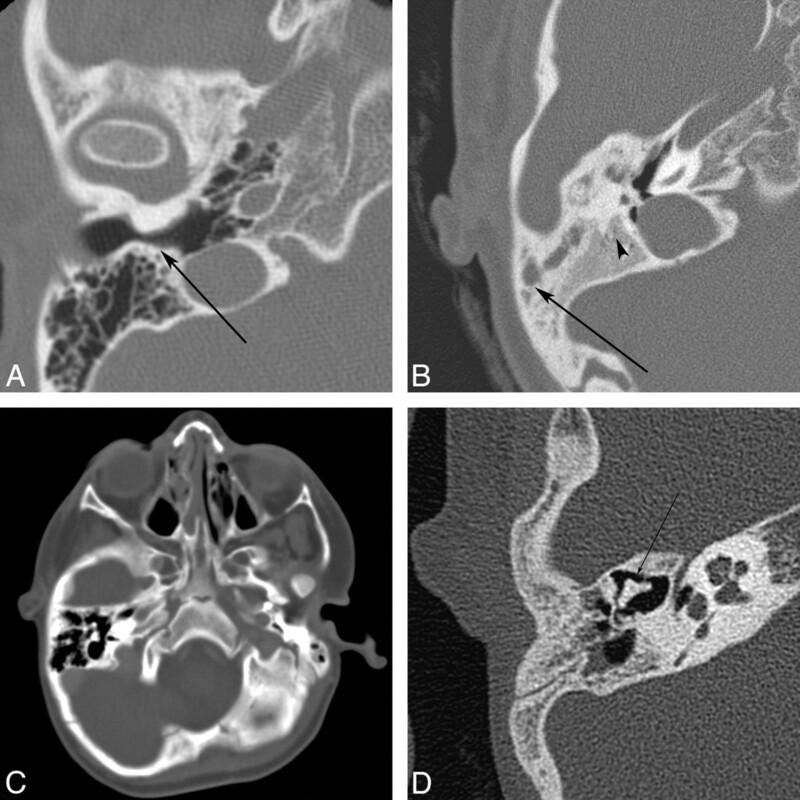 D, Axial CT image in a 6-year-old boy with unilateral auricular atresia with associated ossicular chain fusion (arrow) and microtia (not shown). Jahrsdoerfer et al34 described a 10-point rating scale for the selection of surgical candidates by comparing high-resolution CT findings with postsurgical hearing results. Using 9 reproducible criteria, one calculates a score to predict postoperative improvement of the speech-reception threshold (Table 2). The criteria include assessment of the stapes, oval window, round window, middle ear space, mastoid pneumatization, facial nerve course, malleus-incus complex, and incus-stapes articulation. One point is given for each item with a normal or slightly dysplastic appearance. The stapes is an exception, for which 2 points are given when present. The final point is based on the clinical appearance of a fairly developed auricle. Patients with ≥6 points on the grading system are considered possible candidates for surgical reconstruction. This method has demonstrated clinical utility and also provides a useful evaluation system for the radiologist and otologist. The proper use of this rating scale relies on the availability of high-quality CT examinations and radiologists with detailed knowledge of the relevant anatomy. Milder forms of micrognathia are common in infants and typically resolve with growth of the mandible. Radiologic evaluation of micrognathia should focus on the degree of mandibular hypoplasia, the temporomandibular joint, and the condyle and coronoid processes. One should also look for the often-associated abnormalities of the auricle, maxilla, and palate. Micrognathia is typically associated with malocclusion (abnormal tooth alignment), which may require orthodontic treatments and/ or tooth extraction. Preoperative CT evaluation is important for surgical planning and postoperative assessment of improvement (Fig 6). A 6-year-old boy with syndromic micrognathia. A−C, 3D bony reconstructions show mandibular hypoplasia and abnormal temporomandibular joints, condyles, and coronoid processes. D, Axial CT image shows severe micrognathia and malocclusion. In syndromes involving micrognathia, the oromandibular abnormalities often require the most intensive medical intervention. In severe cases of mandibular hypoplasia, glossoptosis may lead to upper respiratory tract obstruction, with mortality as high as 30%, due to the combined effects of malnutrition, airway obstruction, and failure to thrive.37,38 General anesthesia can be problematic due to problems with intubation. Glossoptosis is also associated with snoring, apnea, and sleep disturbance. In less severe cases, malocclusion may lead to masticatory abnormalities that require orthodontic treatment or orthognathic surgery. Speech therapy may also be required to treat the articulation defects that may be seen in some patients. Microsomia and limited mandibular excursion can produce difficulty with intraoral examinations and treatments that require intraoral manipulation. The first and second BAs are the embryologic origin of many of the structures of the face. A wide variety of congenital conditions may arise from their contents. A knowledge of the anatomic formation of this region is important in understanding abnormalities in development, which in turn aids in the formulation of precise diagnoses and differential diagnostic considerations. We thank Michael Cunningham, MD, PhD, for his assistance with manuscript preparation.